One thing that is as certain as the teams that will be moving on to the second round of the playoffs in the Western Conference, is that each team is lead by a suffocating defense and anchored by exceptional goal-tending. 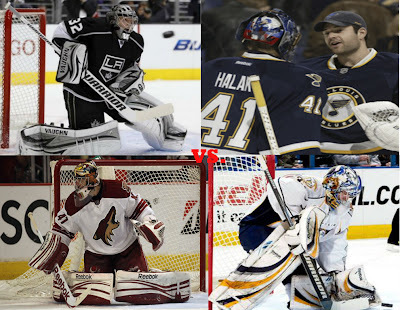 Jonathan Quick of the Los Angeles Kings, Mike Smith of the Phoenix Coyotes, Pekka Rinne of the Nashville Predators, and Jaroslav Halak and Brian Elliott of the St. Louis Blues have all turned out stellar performances through the regular season and playoffs so far. Between the five goalies, there have been 717 shots faced and only 37 of those shots have lit the lamp. Some goalies have faced more shots than others due to the length of their series and individual and other factors, but the individual stats of each goalie is just as impressive. Smith, who has played the most games of the group with six, has a 1.81 goals against average and a .950 save percentage. Quick and Rinne have both played in five games and sport goals against averages of 1.59 and 1.81 respectively. The lone duo of the west, Elliott and Halak, have split time since Elliot took over in game two of the opening round. In the time Halak played, he boasted a 1.73 goals against average and a .935 save percentage. Since Elliott took the reigns the Blues have not struggled, Elliot has a 1.37 goals against average and .949 save percentage. While all goalies have turned out stellar performances, some have had to work a little harder to acheive such numbers. The Coyotes have allowed an average of 40.2 shots per game through six games, which included a 39 save shutout in game six to eliminate the Chicago Blackhawks. Quick is the only other goalie among those mentioned to have also recorded a shutout in this year's post season. The next round will put the Kings and Quick against Elliott, Halak and the Blues. While Smith and the Coyotes will face off against the Predators and Rinne. Needless to say the second round has the looks of a defensive battle, and offensive production may take a steep drop.